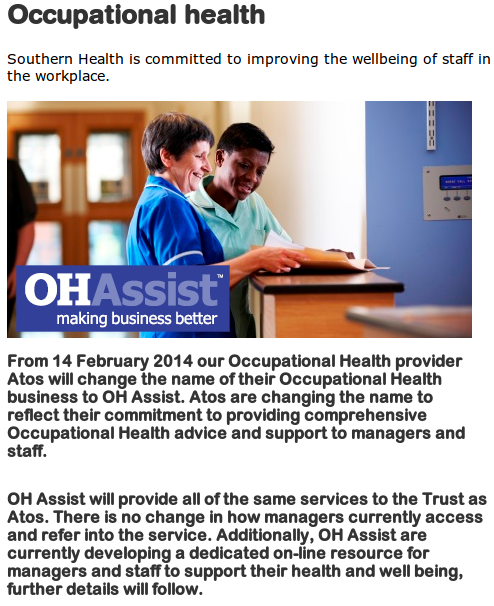 Keen eyes have spotted that Atos Healthcare has re-branded as OH Assist. However this isn’t quite all of the story. Atos Healthcare – a trading name of Atos IT Services UK Limited – had two main areas of business. One is the notorious DWP contract to carry out Work Capability Assessments and more recently assessments for Personal Independence Payments. The other is providing Occupational Health services to large companies. This led to contradictions such as Atos Healthcare telling someone’s employer that they are not fit for work and then Atos Healthcare telling the DWP that they actually are fit for work. Since they are at the frontline of implementing savage Tory cuts, the name Atos Healthcare has become toxic. Business customers of Atos Healthcare have been pressured by campaigners to take their business elsewhere, and no doubt Atos has struggled to employ staff for that service. Atos Healthcare is still operating and their DWP contracts are still being carried out under that name. Atos Healthcare remains only to carry out the contracts for the WCA and for PIP assessments and that is all that is referenced on their website. I am fairly sure that Atos will not be part of any bidding to take on other social security related contracts. I suspect that once Atos can extract themselves from the contract for the WCA (Which seems to be happening fairly quickly) and if they can get out of the PIP contract too (Which they may as they have huge delays and are struggling to employ doctors) then the company will shut down and the Atos Healthcare name will disappear leaving Atos IT Services and OH Assist. While I celebrate the downfall of Atos Healthcare it is important to remember that the problems they perpetuated are rooted in the Work Capability Assessment and that won’t be fixed just because Atos are no longer involved. Some huge news has emerged today after a Freedom Of Information request by the Benefits and Work website. “The number of cases currently with Atos Healthcare has grown. A decision has therefore been taken to control the referral of repeat work capability assessments. Therefore, with effect from 20 January 2014, further routine repeat assessments referrals to Atos will be deferred until further notice. 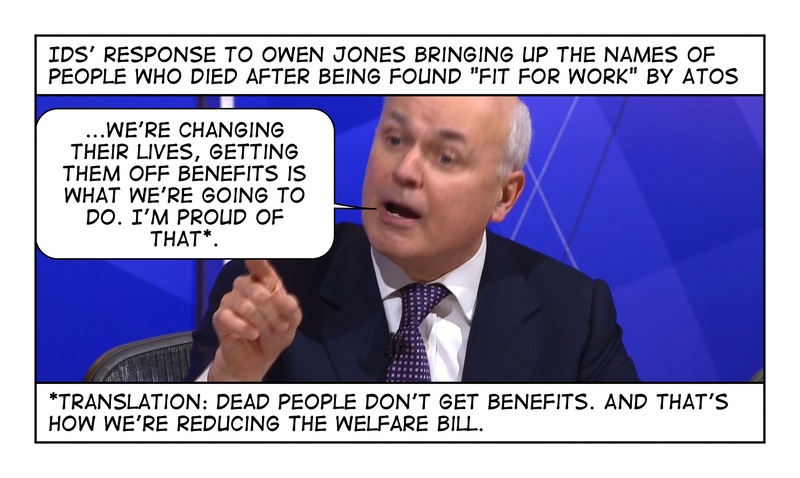 Benefits and Work also claim that the DWP did not intend to inform either MPs or claimants. The uncertainty over the timing and outcome of the WCA is a huge problem for most people who rely on ESA and the knowledge that they will be left alone in the near future would be a great help so it is a further sign of cruelty that the DWP don’t care enough to inform anyone. This decision to suspend repeat assessments sheds new light on the recent announcement by Atos that they are seeking to get out of the contract for WCAs early anyway and on the ongoing battle between Atos and the DWP to place the blame for the failure of the entire scheme. Dr Greg Wood put some speculation into the thinking behind this decision on his blog in the form of a fictional memo – Work Test Whistleblower: A Note For The Minister? According to a report in the Financial Times, (£) Atos are trying to bring an early end to their contract to carry out the Work Capability Assessment. Atos, if you don’t know, are the French IT company that have the contract to assess every person that claims Employment Support Allowance and determine whether they really need support or should be told to get a job. They are notoriously bad at it, with vast numbers of decision overturned by appeal tribunals and many more who could not face the appeal abandoned without any income. The French IT company has been in discussions with the Department for Work and Pensions with a view to exiting the deal since October last year, because it views the tests as “outdated”. Of particular note is that in the article Atos are cited as saying that “the political environment has become untenable” and that the work capability assessment is “outdated”. As I wrote earlier this week the replacement of Atos with another outsourcing company will not solve the problems with the Work Capability Assessment as those stem from government policy and the way in which the DWP enforce the contract so as to keep the numbers deemed eligible for help to a minimum. It is, however, satisfying to see a company which has been quite happy to play it’s part in the cruel and unnecessary suffering of thousands finally admit defeat. Unfortunately the main candidates for the job are G4S, Serco, A4E and Capita. None of these inspire confidence and in fact these names will justifiably inspire anger and hatred in most people that I know. But the problem is not just with Atos. The problem is with the Department of Work and Pensions, politicians (both Conservative and Labour) and with the whole concept of testing sickness and disability and fitting people’s problems into boxes in order to say yes or no to supporting them. Atos have helpfully put the problem in their own words in a blog post pleading with protesters not to blame them. Now I am not siding with Atos here, they are definitely responsible for huge suffering inflicted on people at their most vulnerable and no amount of claiming that they don’t set the rules, or that they are only following orders, is going to change that. However they are correct to say that the eligibility criteria are set by government. More importantly, they are accurate in stating that Atos assessors do not have the scope to make any assessment outside of the guidelines. This is actually a very important admission. You see, there have been consistent accusations that Atos staff work to targets when deciding whether to recommend that someone is able to work or should receive support because they are not. That is, that they are told how many people must go on to receive the social security that they are entitled to and how many must be denied that support. Both Atos and government have denied that there are targets but this is through twisting words rather than actually being true. The DWP may not have targets but they do have “Statistical norms” which say how many people they think should be placed in the Support Group, the Work-Related Activity Group (given some support but continuously pestered to find a job), or kicked off sickness benefits and on to Job Seeker’s Allowance. 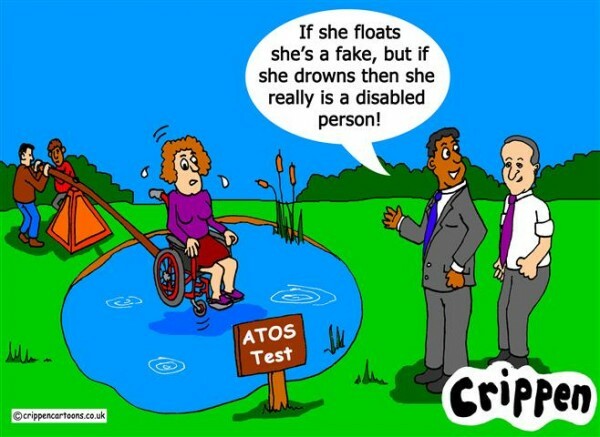 Pressure is put on Atos to conform to these statistical norms – the logic being that Atos must be doing something wrong if they do not meet them. In turn Atos place pressure on their staff to keep the numbers of people recommended to get support down to absurdly low levels. Dr Greg Wood, a former assessor for Atos, and Kaliya Franklin have both done a lot of work to investigate and expose how this works in practice and I have included the links at the end of this blog post. So Atos absolutely are complicit in denying support to people in desperate need, and they know it and their staff know it, but at the same time replacing Atos with Capita will definitely not solve the problem since the replacement will be held to exactly the same requirements. While many believe that this problem with the Work Capability Assessment can be fixed, I am not one of them and so although I will support those who are working towards making the WCA fit for purpose, I also firmly believe that the whole thing should be scrapped. It would be a step forward to believe the reports of the doctors and other medical practitioners that care for sick people and only rely on a specific test for those who do not have access to this for whatever reason, but even that is not enough. I believe that to achieve full support and equality as a society we must introduce a Universal Basic Income / Citizen’s Income that would be paid to everyone regardless of whether they work or not, and not conditional on ability to work or willingness to work. We would still perhaps need some form of checking for disability benefits (currently DLA or PIP) which are paid on top of wages or sickness benefits to those who need it, but even then we should believe people’s own doctors where possible.